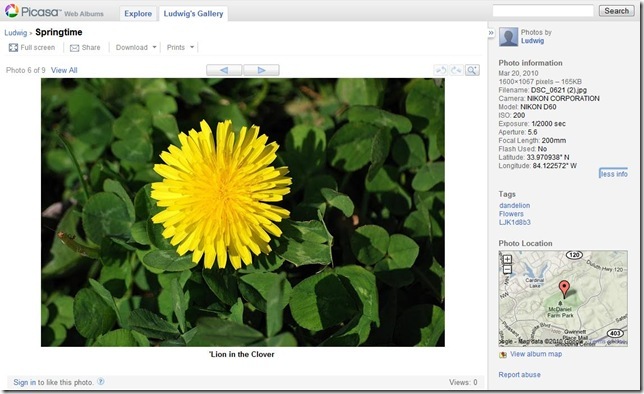 Windows Live Photo Gallery makes extensive use of “tags” for managing and finding photos. The Info pane shows “People tags” – none in this case, “Descriptive tags” that have been assigned either in the import operation or manually later. 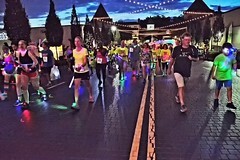 For this picture two tags are shown, there is a scroll bar to allow displaying additional tags. 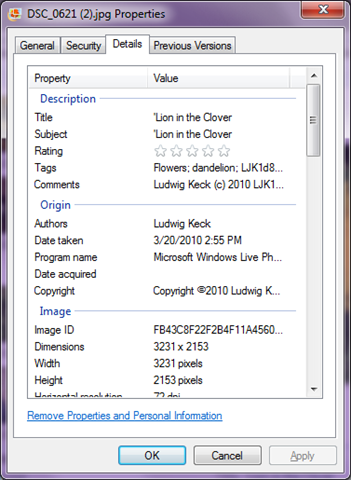 Also shown is the file “Caption” which in other applications may be called “title”. 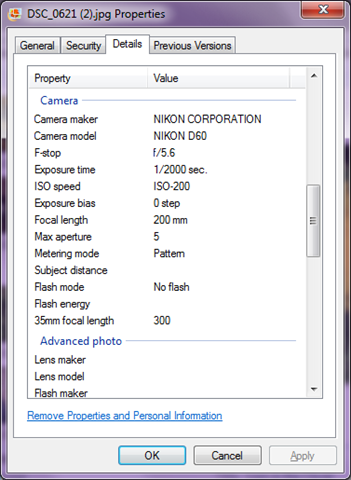 The Information portion provides the file name and details, the rating that is assigned, the “Author” and some of the camera data. Cameras assign file names, during import that can be changed. 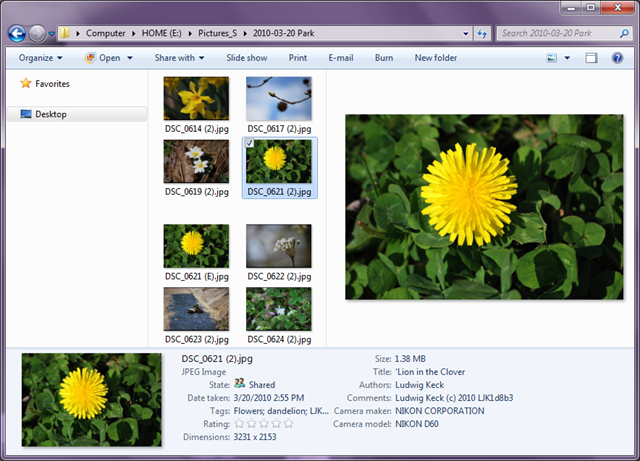 I like to retain the file name assigned by the camera. In this case that name was appended with “(2)” when I made a copy of the file. Notice the top section, “Description” includes the “title”, a “subject” – which can, of course be different from the title, the rating, tags and this can be quite a lengthy list and “Comments”. Comments can be added manually and may be quite long. Many cameras allow the user to define a comment string which is then recorded with each picture. This is what I did in this case. 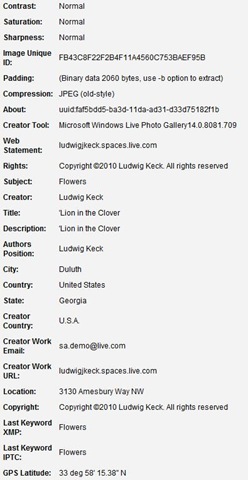 The next section, “Origin”, gives some data, author, and copyright, that was manually added or by a specialized program, and the automatically logged “date taken” and the name of the program that was last used to manipulate the photo, in this case Windows Live Photo Gallery. 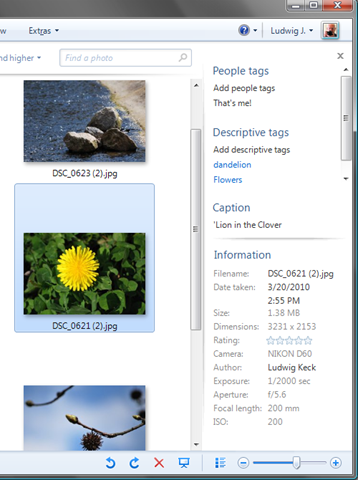 The “Image” section shows automatically generated data, as does the “Camera” and “Advanced photo” sections. There is more, scrolling down reveals the “GPS” and “File” sections. The “file” section provides information about the name, location, and other parameters of the file pertaining to the local computer. 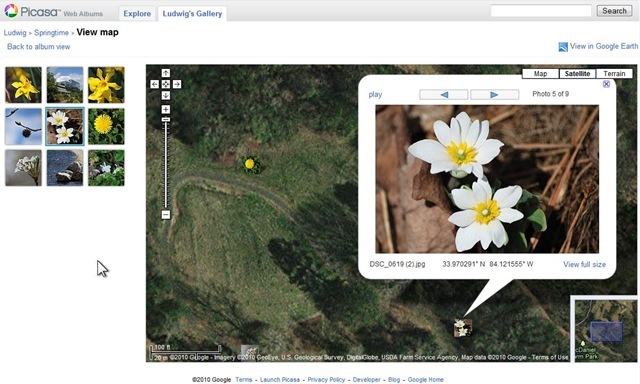 The GPS section shows the geographic coordinates of the location where the picture was take. Some cameras have built-in GPS receivers and can do this “geotagging” automatically. With some, an external GPS receiver can be attached. 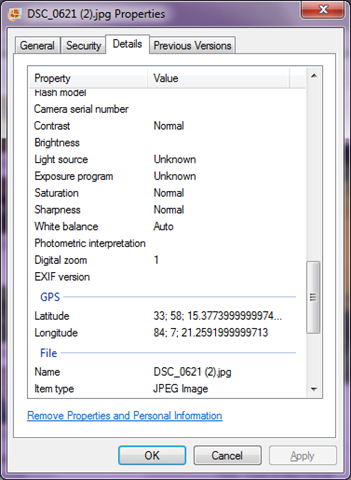 Many GPS units can transfer location data to pictures with special software. There are also applications that make adding this data manually rather easy. There is even more data stored. Some special programs permit displaying more of this information. I want to show a couple of examples of how some of this information is used. 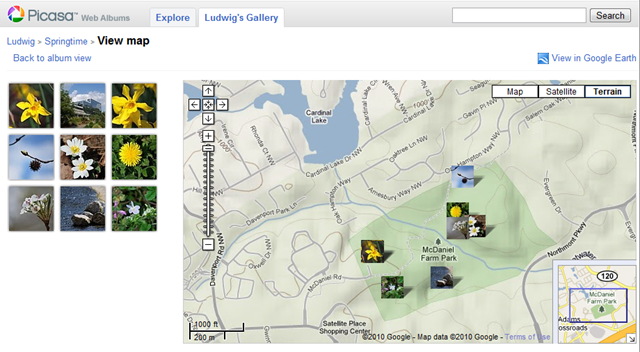 Another sharing site, picasaweb, makes good use of the location information (the image provides a link to the picasaweb page). It shows little thumbnails of the pictures in the album, placed on the map in the locations where the pictures where taken – the map can be zoomed and manipulated. Clicking on a thumbnail shows a larger picture. 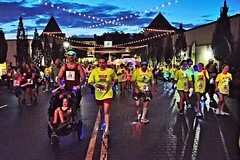 So there is a lot of information that can be attached to photos and used in many fun and valuable ways. In another post I will discuss how to add, delete, and manage this “metadata”. 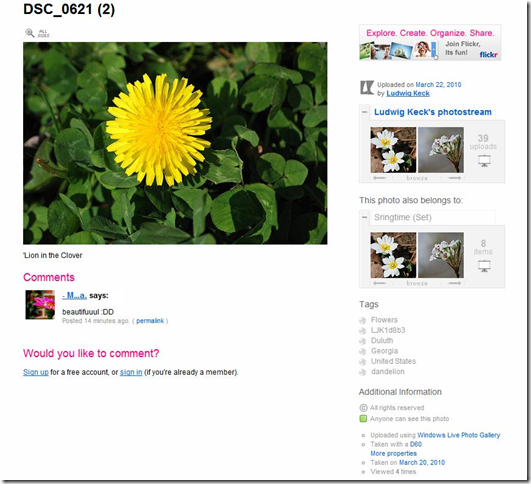 If you would like to explore the flickr or picasaweb images, click on the first image in each sequence above. You can also find these posts in my little book, This ‘n That. 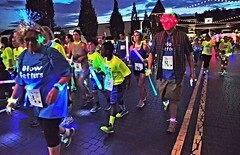 This entry was posted in Digital Photos and tagged geotagging, metadata, photos, tagging, tags. Bookmark the permalink. 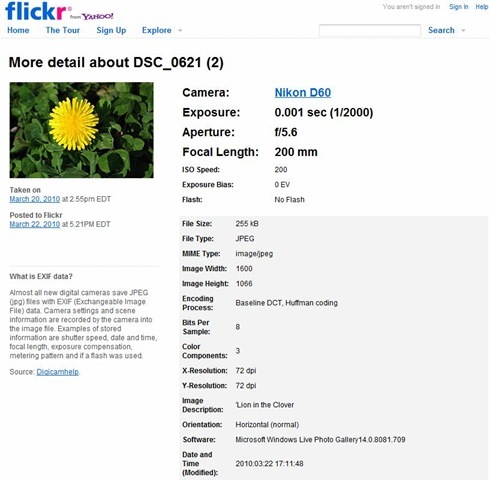 4 Responses to Metadata: There is more in your photos than meets the eye! 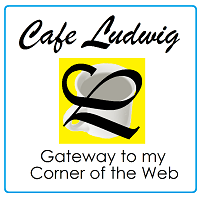 Ludwig, I\’ve been enjoying your articles on WLPG. I have one metadata-related question: Is the metadata exportable/extractable so that it can be used in, say, a database to allow for quick photo searching? Jorge, thank you for your comment and for reading my blog. I don\’t need the metadata much, so I am happy with EXIFTOOL (search "exiftool harvey") it has an option to write the metadata to an external text file. There are many other extract tools – I have no experience with them. Good luck! Thanks, Ludwig. I\’ll check out EXIFTOOL (and others, if needed). If I find something especially interesting, I\’ll drop a note here.